In 1871, the philanthropist, the Earl of Shaftesbury, set up a charity, the Cabmen’s Shelter Fund, to help London cabbies. He erected a number of green huts; they couldn’t be larger than a horse and cart because they sat on the public highway, and they each contained a small kitchen, seats, tables, books and newspapers for up to a dozen men. They were run by an attendant who sold hot food and non-alcoholic drinks. 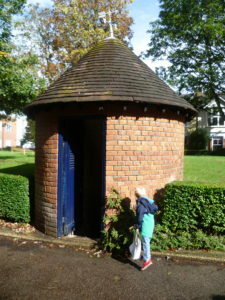 It struck me that London was once full of things like cabbies’ shelters and horse troughs which are now redundant. Most of them have vanished but a few remain – like the occasional horse trough, filled with flowers, and thirteen of the Cabmen’s Shelters, all now Grade II listed buildings. The park warden’s hut is another example of a now redundant hut. The mock Tudor one above dates from the 1860s when the gardens were laid out following the building of the Circle and District lines and the creation of the Embankment and Joseph Bazalgette’s construction of London’s main sewer in the 1860s. But what knocked it sideways? It looks as though it’s suffering from the morning after the night before. Little huts were once everywhere, all self-respecting squares – at least the sort with a garden in the centre – had one. Thornhill Square, built in the 1840s, is a good example. 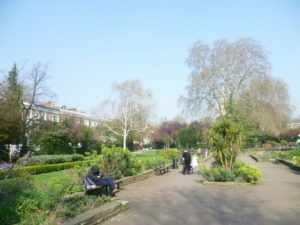 The elegant terrace houses overlook an attractively designed square with paths, rose beds, a shrubbery on a small hillock, various cherry trees, and what is now a magnificent plane tree. 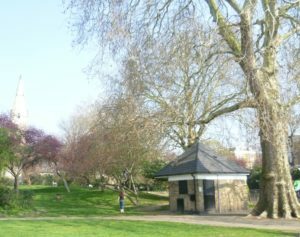 A yellowish London brick hut sits against the tree. The hut warden’s job – a burly man, I remember him well – was to unlock and lock the garden gates at the appropriate times. He was there to keep an eye on the place. There is a small fenced off playground for toddlers with benches for mums to sit and chat; and a larger playground with swings and a slide for older children. The warden sat outside the hut with his dog and, every now and then, they would do the rounds of the square, just to make sure that everything was, and stayed, in order. Which it did. The hut was quite spacious inside with water and electricity, though back in the 1840s it must have been more Spartan. 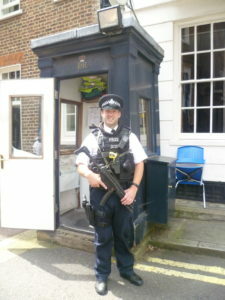 There are other shelters which are still very much in use like this policeman’s sentry box outside the entrance to St James’s Palace and Clarence House, once home to the Queen Mother and now Prince Charles’s London residence. As you can see, the policeman is bristling with weaponry and, on the day I met him, security was high but he was happy to chat for a few moments whilst keeping his eyes peeled for anything untoward. Notice that he, like the park warden in Thornhill Square, also has a chair to sit on. Some small huts, however, can be misleading. The attractive red brick hut with the conical tiled roof in the photo above, is situated in the front garden area of St Leonard’s Close, an expensive 1930s development of classy flats in East Sheen, London SW14. It looks like a dovecot but, in fact, it’s the entrance to a private air-raid shelter dating back to the Second World War, and it leads to a narrow, very steep staircase. 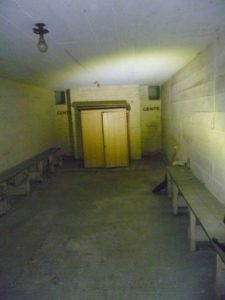 The underground shelter comprises a long corridor and four rooms: a Gentlemen’s and a Ladies’ day room, and a Gentleman’s and a Ladies’ dormitory. At the back of the photo of the Gentleman’s Day Room you can see two recesses on either side of a projecting cupboard. They are labelled GENTS – which is what they were. There was a bucket in each with a curtain across for privacy. It looks very primitive. Our guide once interviewed an old man who’d taken shelter down there during the Blitz; he’d said that the shelter was so horrible that he decided he’d rather take his chance in his own flat. Fortunately, St Leonard’s Court was never bombed. A sentry of the Blues and Royals in his ‘box’ facing Whitehall. Sentry boxes come in all sizes. The sentry in the photo above is known as a ‘boxman’ because his sentry box, at the entrance to the Horse Guards, is tall enough to shelter a mounted soldier. 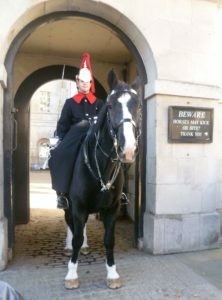 Horse Guards, comprising the Life Guards (with scarlet jackets) and the Blues and Royals (with dark blue jackets), have a dual role: to guard the Queen and take part in ceremonial duties, but they also go on active service, like any other regiment. The sign to the sentry’s right says: BEWARE, HORSES MAY KICK OR BITE. THANK YOU. The sentry doesn’t just stare straight ahead, he looks to both right and left to check for any danger. And, of course, the poor man has to put up with the public trying to make him react, or getting as close as they dare to have their photos taken with him. Fortunately, he doesn’t have to be there for too long; the guard changes every hour so as not to tire the horses. 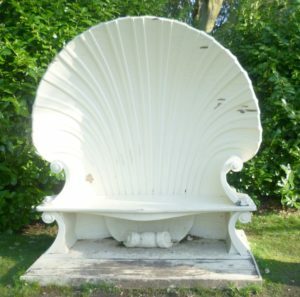 I’m ending with a different sort of shelter, this delightful shell seat, designed by Richard Bentley, friend of Horace Walpole, for the late 18th century gardens at Strawberry Hill. It’s big enough to shelter three or four people, and the top of the shell curls over enough to protect them from the rain. What I like about this miscellany of objects is that, whilst they are all about sheltering people in one way or another, they do so in a pleasing variety of ways. My seven very different shelters feel like a good haul, and they confirm my belief that keeping your eyes open to your surroundings can lead to some fascinating discoveries. I am “collecting” the cabmen’s shelters. So far I have located the one you show near Temple tube, another on Northumberland Avenue near the Hungerford Bridge and one on Lupus Street in Pimlico. I’ve seen one on the south side of Oxford Street west of Oxford Circus too and my husband says he thinks he remembers one in Grosvenor Square. Still eight more to go obviously. 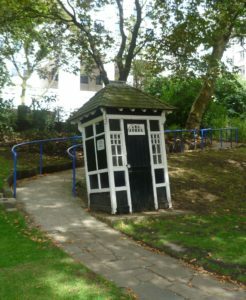 One other street shelter you don’t mention is the blue police-box (Tardis type). I don’t remember seeing any recently. are they all gone? And perhaps they were not a shelter for the local bobby at all but simply contained a telephone. 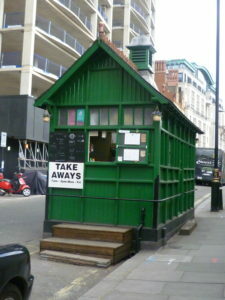 Thank you for your interesting comments, Pauline.There is another Cabmans’ shelter at the north west corner of Russell Square in Bloomsbury – it looks like a Swiss chalet, but green!I, too, remember the dark blue Tardis-like police box but I haven’t seen one for quite a while. I loved this post! The only contribution I have to “huts” is from the Little White House in Warm Springs, GA .This is where FDR (Franklin Delano Roosevelt) had his southern home. You can still see several of the sentry huts that the Secret Service and military used to guard his house when he visited while he was President of the US. Living in Georgia, I don’t really think we have any shelter huts for any other reason. Well tornadoes but that is about it. Those are always underground with the openings set into a bank or flat into the ground. Thank you for joining in the conversation, Vicki, and your interesting comments on the now redundant sentry huts around FDR’s home in Warm Springs. My post was really about small huts which were once common but which are now redundant because they are no longer in use for some reason. Your sentry huts certainly qualify. I don’t know if you have any bus shelters in Georgia; we still have them in London but modern bus shelters are nothing like so attractive as the old wooden and wrought iron ones, so I didn’t include them. As always, a superbly entertaining slice of hidden history! Thank you again. I always enjoy your blog posts. Thank you, Anne. Blogging is a strange activity; you send a post out into the world, and you haven’t a clue how it is going to be received. Sometimes, a post starts quietly, and you think ‘Hm, that was a bit of a mistake’ but then it picks up and you find that people are still looking at it months, or even years later. I think of my readers as Blog friends, sometimes from far flung places, and I count you in, of course. Oh my goodness, Anne! How I sympathize – the horror of always being cold, those ghastly white ankle socks, the lumpy custard. I was sent to a boarding school which I simply loathed. I had nightmares about being back there for a number of years after I left. But I agree with your readers – that awful experience has made a brilliant blog. Thank you again! Glad you enjoyed it. You could obviously relate to certain memories!